After a long, oppressively humid afternoon, it finally started to rain. But as people began moving towards a nearby tent for cover, Kim Jackson stayed put, taking a drag of her cigarette and looking up at the sky. Jackson, 38, had just been released after spending four days in Atlanta’s Fulton County Jail. She and her boyfriend had gotten into it over the weekend, their first major fight in ten years of dating. She’d pushed him, he’d pushed her back. He called the police, hoping officers could mediate the situation by asking Jackson to leave. The National Bail Out collective last year garnered over $1 million in donations, which allowed the group to bail out nearly 100 Black women across 6 cities. This year, the collective bailed out 147 Black women in 26 cities, including six SONG chapters. Because they both described pushing, the officer who arrived insisted on taking one or both of them into custody. Jackson’s boyfriend tried to to talk him down, insisting that he didn’t intend for anyone to be arrested, but the officer stayed firm. “We can’t just come out and not take anybody,” Jackson said the officer told them. It had to be one or both of them. They opted for both. Jackson was hit with a battery charge and a $1500 surety bond -- she needed to pay ten percent, $150, to be released. “I just didn’t have it,” she said. 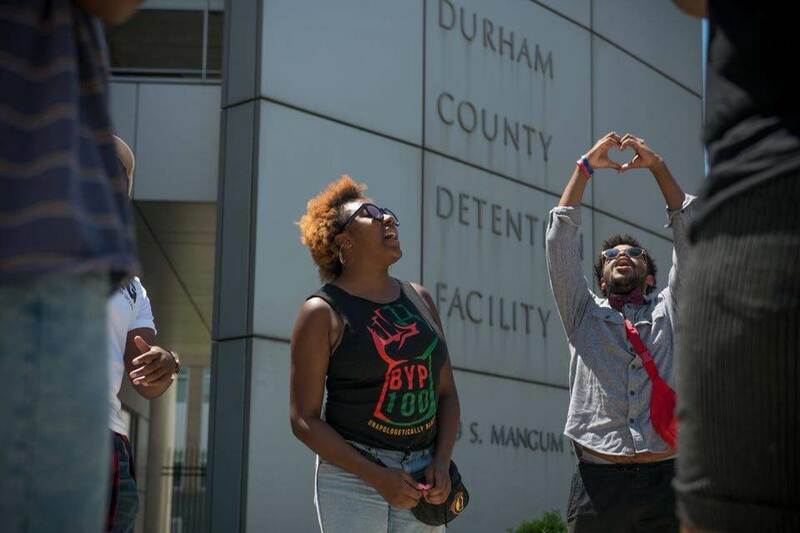 A queer Southern grassroots organizing group, Southerners on New Ground, paid Jackson’s bail as part of the group’s second annual Black Mama’s Bail Out action. The event, a collaboration between SONG and a number of other groups engaged in the National Bail Out collective, last year garnered over $1 million in donations, which allowed the group to bail out more than 100 Black women across 6 cities. This year, the collective bailed out 147 Black women in 26 cities, including six SONG chapters. Hooks and SONG hoped that the bailout actions could show policymakers that women sitting in jail couldn’t wait for policy changes to arrive. Jackson’s four days in jail left her unable to contact her employer, and potentially without a job; many of the women she met in jail had been there for weeks, and had lost far more. “Inasmuch as we need policy to change systems, we also need people to be able to take radical action to do what we need to do to allow people to change our material conditions right now,” Hooks added. The bailout actions sparked policy conversations about cash bail practices in cities across the country, notably in Southern cities like Nashville and Birmingham, where organizers have successfully lobbied city officials to expand pretrial release programs and create a pre-trial services agency, respectively. A series of lawsuits filed in the last couple of years by legal advocacy groups like Civil Rights Corps, Southern Center for Human Rights, and American Civil Liberties Union have also added pressure in places like Glynn County, Georgia, where the ACLU alleges that cash bail practices discriminate against poor defendants. In Atlanta, SONG organizers have catalyzed a few notable policy victories around cash bail practices since last year’s bailout action. Atlanta City Council passed a resolution in February to supplant cash bonds with signature bonds for some misdemeanor offenses, a reform championed by Mayor Keisha Lance Bottoms as part of her platform in a contentious mayoral election. Georgia legislators also approved a bill requiring judges to take defendants’ financial circumstances into account in bail determinations. But organizers have yet to see these new cash bail mandates enforced. In all the bail hearings Hooks sat through for the bail out action, only once did a judge, prompted by a public defender, change his bail determination because of a defendant’s need. “People don’t know how to implement it or they’re not willing to implement it,” she said. Even if the policies were to be enforced, however, SONG organizers see a lot more ground to cover before Atlanta has a truly reformed bail system. Although Atlanta’s reforms offer some steps towards a more need-aware bail system, Jackson isn’t covered by the new reforms. During debates over the Atlanta’s new cash bail policy, city councilors were quick to draw lines around “violent” offenders, leaving cases like Jackson’s subject to the same devastating financial ramifications as before. Hooks hopes that legislators’ next steps toward bail policy reforms rely on more nuanced ideas about what “safety” and “violence” really mean. “Public safety is about housing, it’s about jobs, it’s about people having a quality of life. That’s how you get public safety. It’s not because of how many cops you have on the street or how many people you keep in a cage,” she said. Atlanta’s reforms came remarkably quickly. Mayor Bottoms announced in January that cash bail reform would be one her first priorities, and by February 5, the new city ordinance had already been approved. Though organizers were excited about policymakers’ interest in the issue, they want to be sure that future reforms take the time to think through all of the issues accompanying bail. Atlanta isn’t the only city jumping the gun on reform action. “People are bringing forth different reforms, which is a good and a bad thing depending on who’s being consulted when the reform was made, if they even have enough understanding to do anything beneficial, or if it’s just creating more problems in the long run,” Micky Jordan, SONG communications associate, said. Part of the difficulty organizers face in trying to sort meaningful and harmful reforms from one another is that bail systems vary enormously. “As we’ve been doing this work for the past year, we’ve learned firsthand that the bail system looks different depending on what city what county and what state you’re in,” SONG regional organizer Nicole Townsend told Scalawag. Richmond uses a bond system rather than a cash bail system, but local organizers find that many folks are denied bond. Asheville will accept both cashier’s checks and cash for bail payments; Charlotte only takes cash. “Those are the small nuances that, if we’re coming across them, we can only imagine what individual families are dealing with,” Townsend said. While some policymakers are overly anxious to put reforms in place, others are actively opposed. After Atlanta passed its city ordinance ending some cash bail practices, some Georgia state lawmakers added language into an anti-immigrant bill to reverse the ordinance. House Public Safety and Homeland Security Committee chair Alan Powell told the Atlanta Journal-Constitution that the existing bail system allowed too many dangerous people released without proper vetting. The bill produced an outcry from multiple local groups, and was not called for a vote before the end of the state’s legislative session. Despite the success of the bailouts in raising the profile around cash bail, SONG does not intend for the bailouts to be a permanent fixture of their work. “We’re viewing this action as more of a tactic, not something we’ll do forever,” Jordan said. But the organization does hope to establish a model for the kinds of reforms they hope to see codified further down the road. Jordan, alluding to the Underground Railroad used to get runaway slaves to freedom, said SONG is looking to make a “tunnel system of social services” through these bailout actions. The organization has arranged for a team or case manager in each city to follow up with those released on bail for up to 90 days, a tough lesson learned from difficulties some of the women bailed out in last year’s action faced after release. Who wins when festival season comes to Durham? After years spent as a languishing old tobacco town, now Durham finds itself brimming with cultural capital. But a springtime full of festivals has become a referendum on the city’s soul-search, begging the question of just who Durham is for.